Different is not necessarily better or worse. I took notice of this upon moving from the Echo Park district of Los Angeles to Irvine. Some acquaintances and casual observers viewed it as a shift from ground zero of hipster chic to the center of conformity. Neither comes close to capturing the truth about either place. Irvine is very different from Echo Park—not necessarily better or worse. That’s my point of view as a resident who appreciates aspects of both places. Here’s a viewpoint from a broader perspective: I can see why a lot of observers and even some residents of Irvine see the city as a paean to conformity. The cityscape obviously conforms to any number of standards, some of which seem to be downright capricious. Must earth tones dominate the palette of the entire city? Must opportunities for legal U-turns be so rare? There’s no denying that anyone who’s unfamiliar gets little help from landmarks as they find their way around Irvine. A lot of the streets have a similar look and feel. Many are bigger and busier than they seem at first glance. Cars are the boss, and it can take a while to get one’s bearings amid the slight distinctions of streetscape and zippy pace of traffic. It’s taking me awhile, but a few things are coming into focus. I find it helps to think of the city as a canvas and to get to know its brush strokes. There is a street grid, with major thoroughfares generally oriented on north to south and east to west. It helps to think of them as freeways. The housing subdivisions are like small towns. The shopping centers are downtown commercial districts. Get that in mind and it helps put the city in perspective. 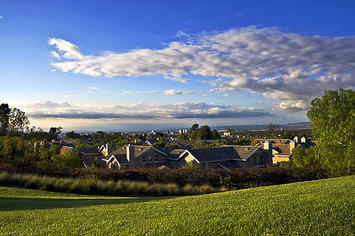 Once you put Irvine in perspective you begin to realize its design. Yes, the city is designed to a T—so much so that the “conformity” tag gets affixed by critics in gentrified neighborhoods filled with hipsters, including many who don’t realize that they themselves have gotten comfortable with uniformity. Listen closely to those same critics and you’ll realize they actually crave the sort of design that defines Irvine. Go to a community meeting in a gentrified neighborhood and you’ll likely hear all sorts of calls for strict design standards on everything from signs for mom-and-pop stores to street lights and dog parks. The difference between the design-obsessed enclaves of inner cities and Irvine owes to Donald Bren. His Irvine Company shares its name with the city. He grew it out of acreage that had been the historic Irvine Ranch. Bren’s vast landholdings have given him an unusual scope of control over how Irvine has taken shape. Bren is apparently obsessed with design. It’s also apparent, however, that his obsession works toward a clear purpose. He seeks a profit in the marketplace. The same hipsters who knock Irvine for conformity should appreciate the profit motive. Many of them look back fondly on pages of history that tell the stories of captains of industry who built company headquarters, stores and even factories as monuments and legacies. Ask a hipster about the Chrysler Building in New York or the Wrigley Building in Chicago. Get ready for a stream-of-conscious review of the elegance of those structures. You’ll hear about the glory days of magnates who were not beholden to quarterly profit reports and could freely direct their wealth to aesthetic pleasures for public view without questions from shareholders. You won’t hear Bren mentioned, but he should be. I know this much from my brief time in Irvine: The place is a big canvas, and much of it has been filled by Bren. The conformity that critics see actually is design. It just happens to be on such a grand scale that it requires a broader perspective than can be gained with drive through and a look around. You have to live with it awhile—or perhaps take it in from several thousand feet in the air. Nobody has to like Bren’s design. Fair is fair, though, and it should be understood that nothing of the scale and scope of what Bren has created can be fairly called conformity. Sullivan is managing editor of the Orange County Business Journal (ocbj.com), where this column originally appeared. Submitted by xxdllb1122 on Thu, 03/05/2015 - 07:08. Submitted by xijozx1122 on Tue, 03/03/2015 - 09:52. Submitted by xijozx1122 on Mon, 02/16/2015 - 05:32. Submitted by xygwfl1122 on Mon, 01/19/2015 - 08:42. Keep up the great work , I read few blog posts on this site and I believe that your website is real interesting and has bands of good info . Submitted by zion1122 on Tue, 08/20/2013 - 05:10. Wondering About Skid Row: Whatever Happened to Work? Stagnation in the City of Angels: Whatever Happened to Ideas?